DETAILS: Location, Location, Location! 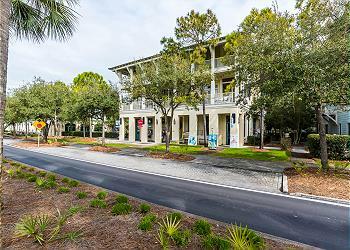 Nestled in the highly coveted Watercolor community, this two bedroom, two bathroom condo sits on a corner unit with a wrap around porch partially screened for outdoor dining overlooking 30A! As a one floor condo, Unit 202 is ideal for couples or families who prefer to keep the group close together and without the hassle of stairs. With the Beach Club, Cerulean Park and Wine World at your back door, you'll be nearby Watercolor’s best shops, dining and recreation! This is the second time that we have stayed at this unit. The first was in September 2017. It was as if we came home. It was comfortable and roomy. The beach was beautiful and the alternate pools were enjoyable. We cannot wait for the improvements at Camp Watercolor and the Beach Club. We will be reserving again in 2019. We took a short day trip to Panama City Beach and rode the SkyWheel at Pier Park. It was worth the drive. The Shops at Grayton Beach is another recommendation. See y’all next year. We are so glad that you had yet another vacation with us in Watercolor! We completely agree that this condo is like a home away from home! We are also very eager to see the new additions to Camp Watercolor as well as the Beach Club as well as seeing you and your group again in 2019! Loved the stay at 1777 Watercolor. I thought I would not like it that we were right on 30A, but I enjoyed watching the world go by from the 2nd floor screened porch. The location also has you right at the beach! Bright, open floor plan with private bedrooms. Mattresses were fantastic!. Furniture was in good shape. Master bathroom shower handle was broken so difficult to turn on. We loved the bikes and ability to get out and explore the area without taking the car. We are so delighted that you enjoyed your stay with us in Watercolor! We agree that sitting out on the wonderful porch and enjoying the community of Watercolor is a great way to unwind after a fun day of exploring on the house bikes! We hope we have the pleasure of hosting you again very soon! We had a wonderful time! The condo was nicely decorated, well stocked and very comfortable for our family of five. We are so glad that you and your family had a wonderful Watercolor Vacation! We agree that this condo is a great option for a fun and relaxing beach getaway! We hope to see you again very soon! The condo unit was great. It’s decorated well, comfortable furniture with outside seating. We had 5 girls for the Seaside Half and everyone was comfortable. Great spot for an easy walk to the start. Thank you for choosing 360 Blue for such a special event and congratulations on running the half marathon! We hope to see you back soon! We are beyond thrilled that you had such a great stay! This amazing house is the perfect place for a quiet getaway. We look forward to seeing you back soon! What a great photo! We are so happy to hear you enjoyed your stay with us in Watercolor. The floor plan for this unit really is perfect multi-family groups! Thank you so much for choosing 360 Blue for your beach vacation. We hope you'll be back to see us again soon!